Mr. Angel Gurría, Secretary-General of the OECD, was in Ankara from 2 to 6 September 2015 to deliver and present OECD’s work on inclusive labour markets and skills to the G20 Ministers of Labour and Employment and our analysis and recommendations on growth, investment, SMEs and taxation including BEPS to the G20 Finance Ministers & Central Bank Governors meeting. While in Ankara, the Secretary-General also held several bilateral meetings with high-level officials attending the events. Mr. Gurría also delivered a keynote address at the Women-20 official launch event. 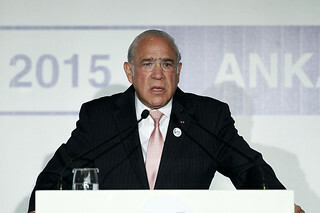 OECD Secretary-General Angel Gurría speaking at the W20 launch in Ankara, Turkey, September 2015.